If you love avocados, but don't know what to do with them other than serve them with tortilla chips, this is the perfect cookbook for you. With its buttery texture and subtle flavor, the avocado pairs well with meat and seafood, makes a great topping for burgers and salads, and adds a wonderful creaminess to dips, sauces, and even desserts. Absolutely Avocados presents delightfully delicious new ways to use avocados in breakfasts, lunches, salads, snacks, and plenty of the ways you haven't even imagined. 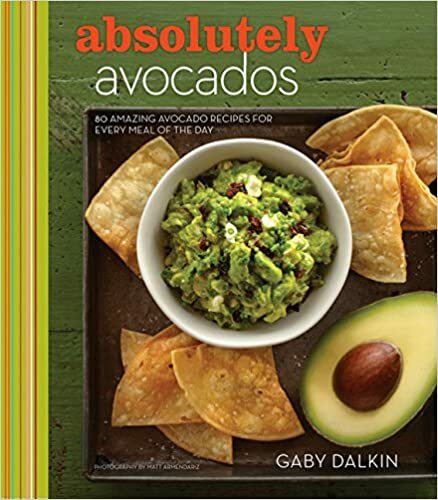 But this is more than just a book of avocado recipes; it's also the first cookbook from renowned blogger Gaby Dalkin. Displaying her fresh and simple cooking style—a mix of California casual with a healthy dose of Southwestern flair—Gaby's recipes are ideal for anyone who loves avocados or just scrumptious meals. If you love avocados and fresh, delicious meals, this is the ideal cookbook for you. Absolutely Avocados serves up a wide range of recipes that get the most of out of this popular, but under-used food.